A boozy, summery jello shot recipes for adults! 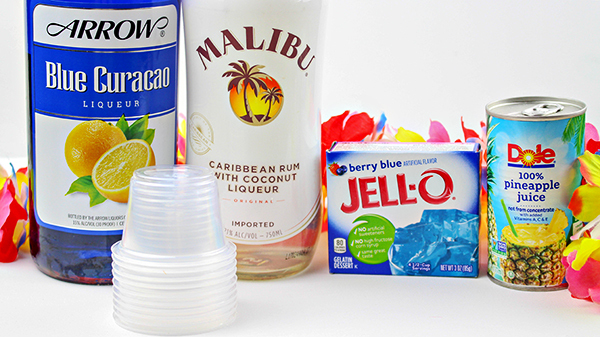 This Blue Hawaiian Jello Shots Recipe gives you colorful blue jello shots, made with Blue Curaçao liquor, Malibu Rum and lots of tropical flavor! Perfect for your summer parties, 4th of July, or any occasion where this boozy treat for adults will be appreciated. Summer is here and we have a fun jello shot recipe to share with you! If you’re having friends over for any summer party or get-together, then jello shots are a fun addition for the adults. As you may know, “Jello Shots” are jello gelatin, infused with booze. They are usually served in small individual-sized disposable plastic cups. You can make jello shots with different types of liquor and in lots of different flavors. 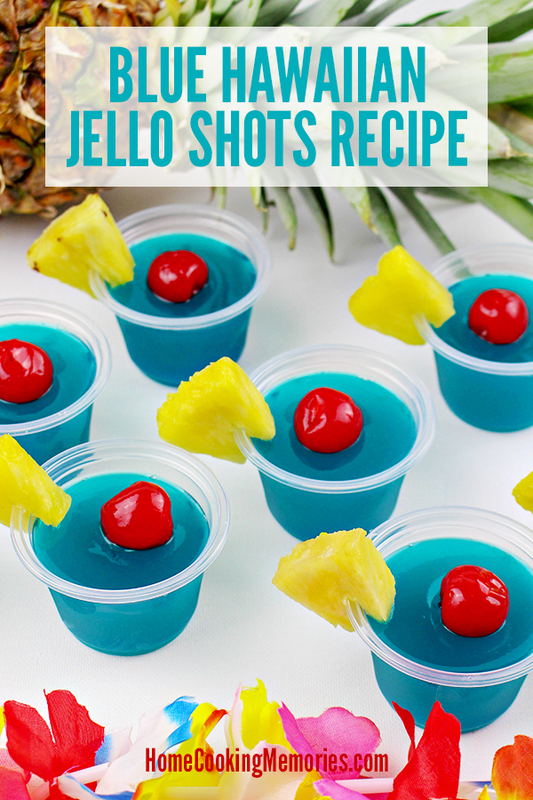 Today we’re sharing with you an easy Blue Hawaiian Jello Shots Recipe, but we have a basic Cherry Vodka Jello Shot recipe you might like. 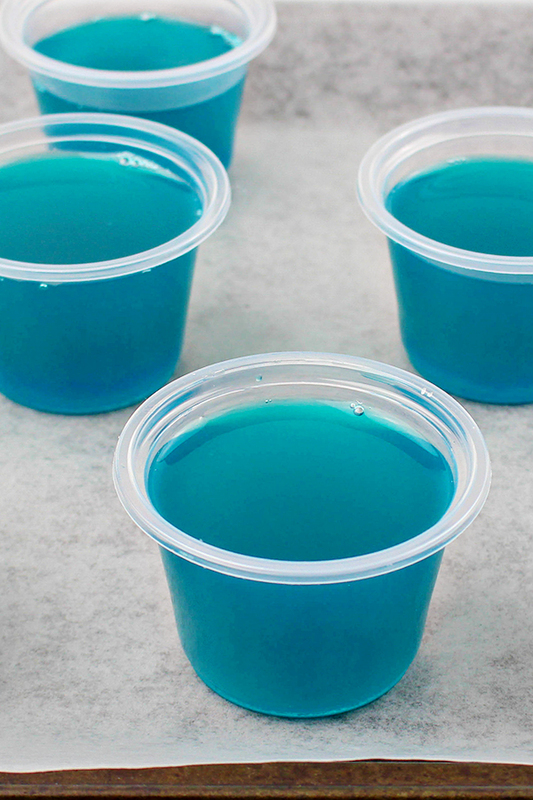 This Blue Hawaiian Jello Shots recipe is inspired by the popular Blue Hawaii Cocktail. It’s an easy jello shot recipe, with a bright blue color with thanks to the Berry Blue JELL-O and the Blue Curacao liqueur. It’s also made with Malibu Rum, which gives it a coconut flavor, as well as pineapple juice. 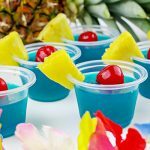 To give your Blue Hawaiian Jello Shots a great look, you’ll want to top them off with a red maraschino cherry and a piece of fresh pineapple wedge on the edge of the cup. As with pretty much, all jello shot recipes, this one is super simple. In a large bowl, combine the powdered Berry Blue JELL-O with boiling water to dissolve it. Next, you’ll add the Malibu Rum, Blue Curacao liqueur, and the pineapple juice. 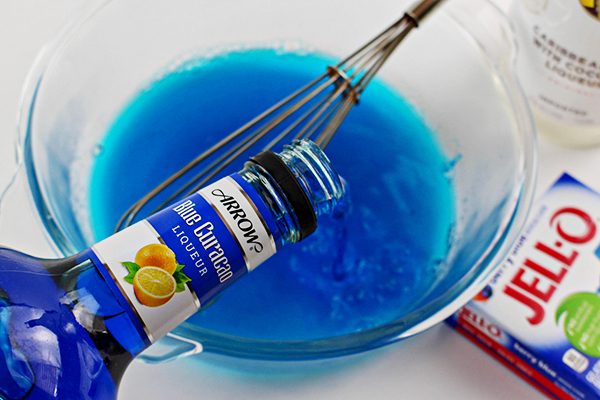 Stir the jello mixture, your liquors, and pineapple juice together. Place your small plastic cups on a tray and pour the jello mixture into the cups. 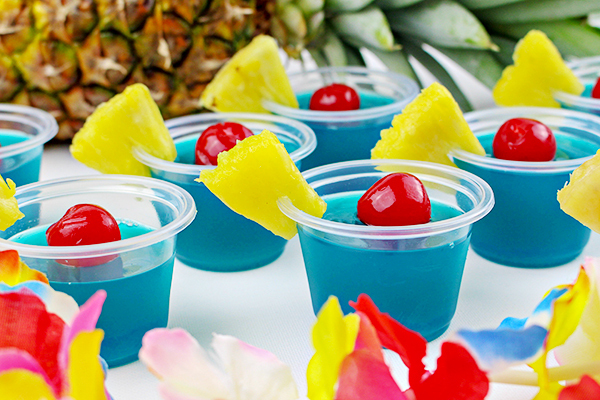 Place your tray of Blue Hawaiian Jello Shots in the refrigerator and chill for at least 4 hours or overnight. 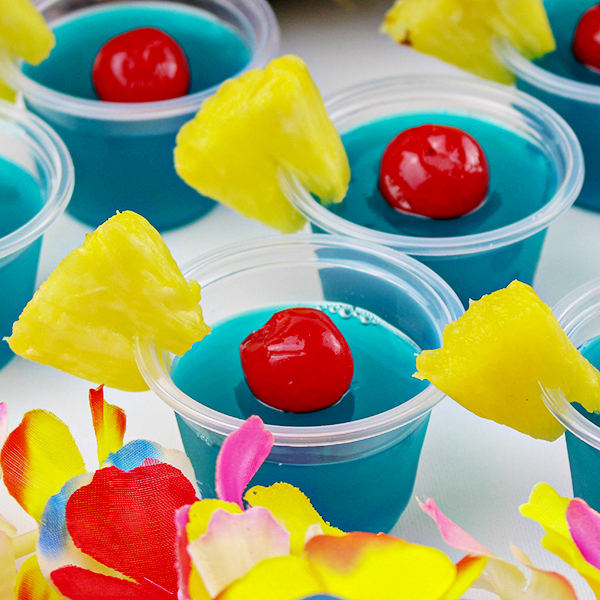 Before serving these Blue Hawaiian Jello Shots, we recommend that you fancy them up with some garnishes. Take some fresh pineapple and cut it into small bite-size wedges. Cut a slit into the pineapple wedge and place it on the rim of each jello shot cup. 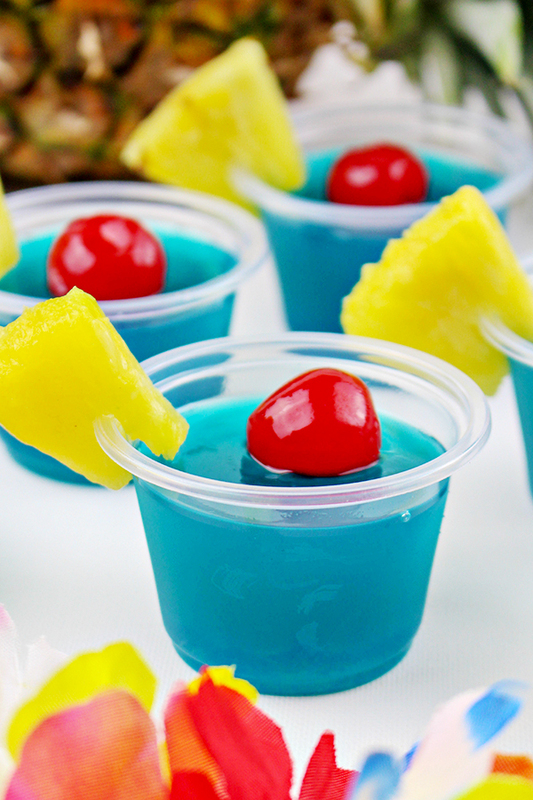 Place a maraschino cherry on top of the blue gelatin, right in the middle of each Blue Hawaiian Jello Shot. Here’s the full jello shot recipe ready for you to make for your party or get-together! Like this recipe? 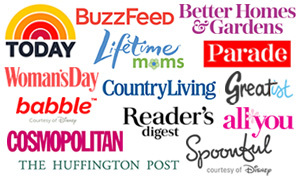 We’d love for you to save it to one of your Pinterest boards or share with your family or friends on Facebook! Thank you for your support! 1. Place the plastic soufflé cups on a baking sheet or tray. 2. Add the powdered JELL-O to a large mixing bowl and pour the boiling water into the bowl. 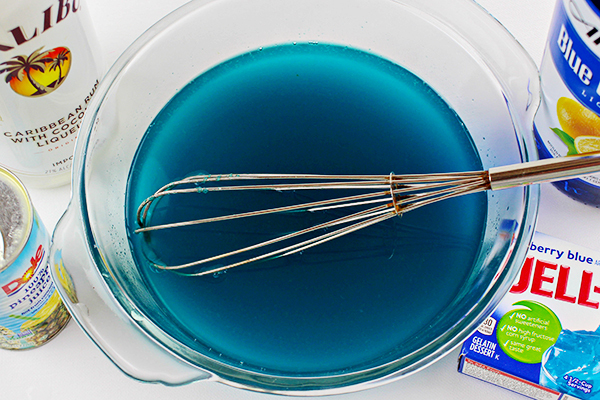 Whisk until the gelatin is fully dissolved. 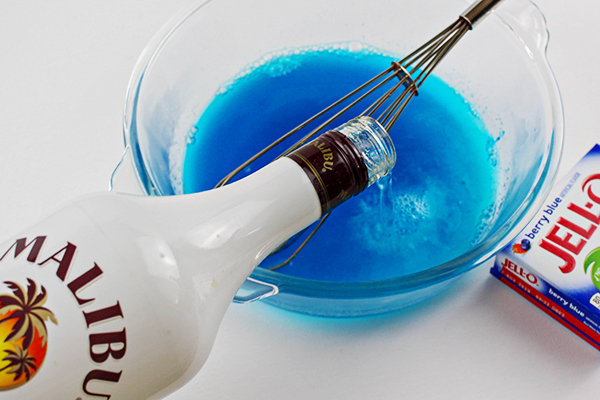 Add the Blue Curaçao, Malibu Rum and pineapple juice to the gelatin mixture. Stir to incorporate. Pour the gelatin into the cups. Place baking sheet or tray of jello shots into the refrigerator and chill for at least 4 hours or overnight. 3. Before serving, cut fresh pineapple into bite-size wedges and cut a slit into each pineapple wedge. Place each wedge onto the rim of each jello shot cup. Place a maraschino cherry on top of the blue gelatin, in the middle. If you prefer, you can use canned pineapple chunks for the garnish on the rim. Be sure to drain them well before using. So colorful and fun! Thanks for sharing with SYC. Great jello shot recipe shared. To beat the heat a perfect blue shot. These are perfect party treats! I am sure many of our guests at Fiesta Friday party will love these. They look so pretty as well. Thanks for sharing and happy Fiesta Friday! These look stunning. I’m sure it’s a burst of flavours. Perfect for a party treat! These are seriously the prettiest jello shots I have ever seen! They would be perfect for literally any summer party. Thanks for sharing your awesome recipe with us at Merry Monday this week! Looks like a fun dessert!! Welcome Summer! Thanks for sharing at the What’s for Dinner Party – Hope to see you again next week!